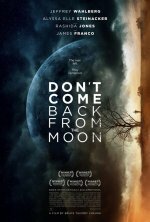 Don't Come Back From The Moon release date was Friday, January 18, 2019. This was a Limited in theaters release. A story of abandonment, when all the men in a remote California desert town walk away from their families, one by one. They leave their angry, frustrated sons and daughters behind — kids who act out, engage in acts of petty burglary and vandalism, and look for love and family connection in the aftermath of their abandonment, all the while trying to understand why their fathers have “gone to the moon,” leaving them to traverse the difficult path to adulthood alone.